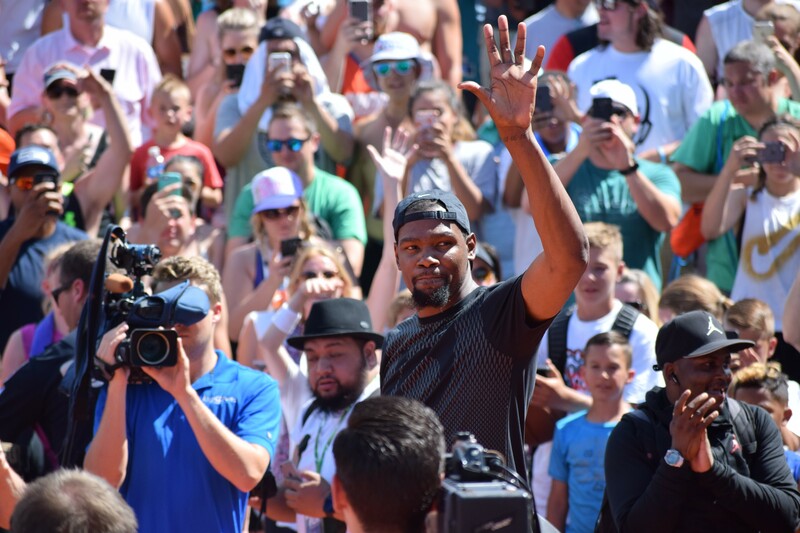 Kevin Durant at Spokane Hoopfest 2017. It was supposed to be a secret. 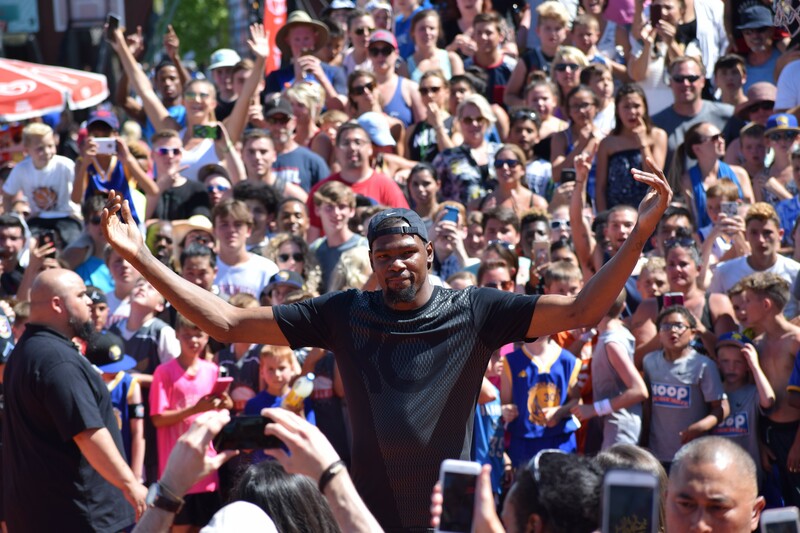 Nobody announced that Kevin Durant would be showing up at Nike Center Court on Sunday. But when you're as big a deal as Kevin Durant, NBA Finals MVP and champion, word tends to get out. Early on Sunday, some people had heard the rumor that the Golden State Warriors' star was in Spokane. Friends told their friends, and those friends told their friends, but nobody really wanted to get their hopes up. Kevin Durant? In Spokane? The rumor was that he would show up to Nike Center Court around 2:30 or 3 pm. By 2:15, the bleachers were full and the heat was beating down on the court during the men's elite games. 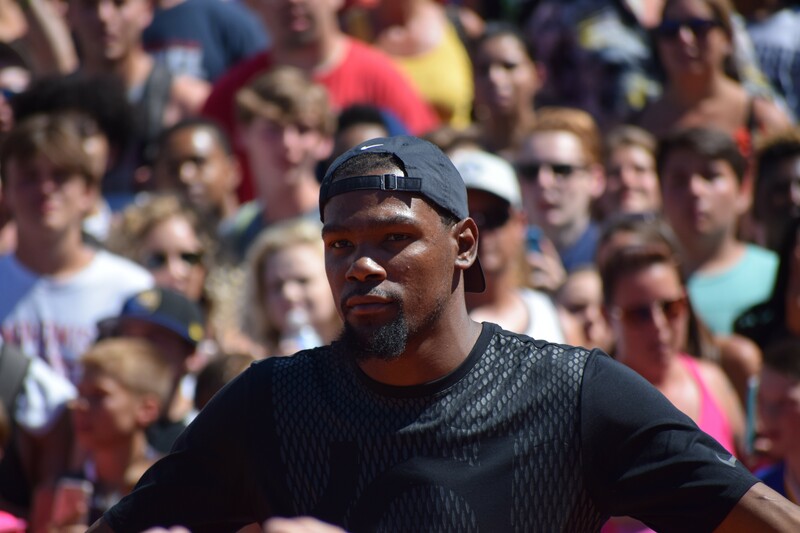 People in the stands were whispering to each other — maybe Durant isn't coming. Is it worth suffering in this heat? Was it a false rumor? 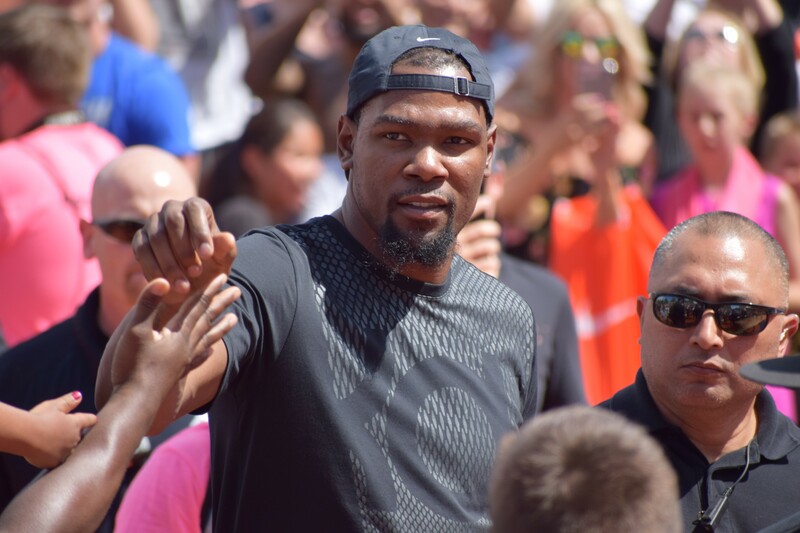 When a few security guards gathered in one place, everyone looked over to try and catch a glimpse of Durant. But it was a false alarm. The security guards were just telling people to get off the court. Then, we saw him. Everybody stopped watching the game in front of them (and it was a good game!) and turned toward where Durant was walking in. A timeout was called on the court as Durant walked across, and everyone took out their phones to get a picture as he pushed past a swarm trying to get close to him. Chants of "M-V-P!" were shouted from the stands. Kevin Durant arriving to Nike Center Court at Hoopfest. He went over and leaned against the media tent to watch the game between the two men's elite teams. Lee & Hayes, a team that included former Zag Mike Hart and former Eastern Washington University player Parker Kelly, won the game and eventually won their division. Yet few people seemed to care about the game at that point. All eyes were on Durant. Eventually he went on the court and answered some questions about why he came to Spokane, and his time in Washington when he was a member of the Seattle SuperSonics. He noted that this wasn't his first time here in Spokane — he was here in college, playing for the University of Texas in 2007, when the city hosted first-round NCAA tournament games. "This is kind of where I got started, and then going to Seattle was one of the best years of my life," he said. "I'm always going to be a part of the whole state of Washington and Seattle as well, so it feels good to be here today." Durant walking onto the court to answer some questions. He talked about winning the NBA championship two weeks ago, saying he's "kind of depressed now that it's over, it was so much fun." "To be a champion and to win the way we did, the selflessness we showed as a group, that's what basketball's all about," he said. Everyone cheered when the Q&A period was over, and Durant was loving it. Durant takes it all in. Then he played 3-on-3 with some lucky kids. Everyone was hoping he'd make an outside shot, but he was off. You can barely see the head of the kid trying to play defense on KD. So he decided he would just dunk the ball. 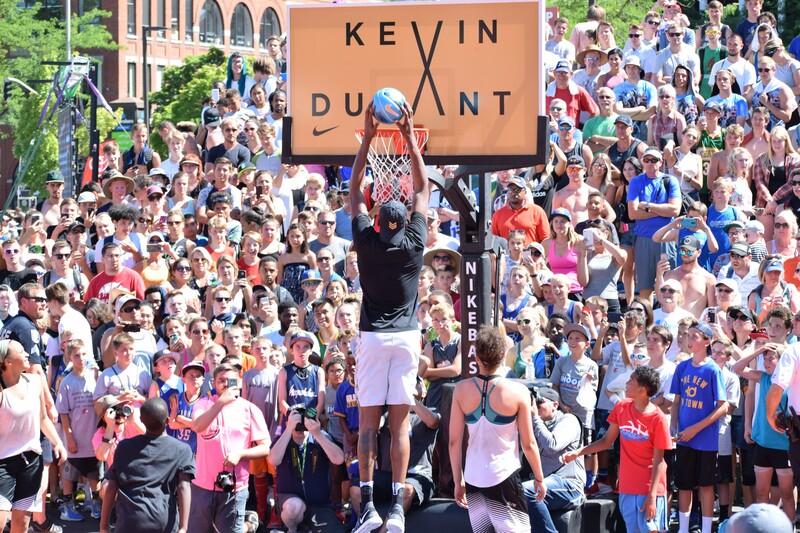 The backboard on Nike Center Court made sense once Durant showed up. He then shot T-shirts and basketballs into the crowd. Afterward, he went up into the tent to watch the slam dunk contest. There, KXLY's Derek Deis was able to catch up with him. "It feels great," Durant told Deis. "I think it just feels even better to kind of be the face of, like, street basketball. You know, that's pretty cool to me, that whenever something like this is happening, I'm here to support it." 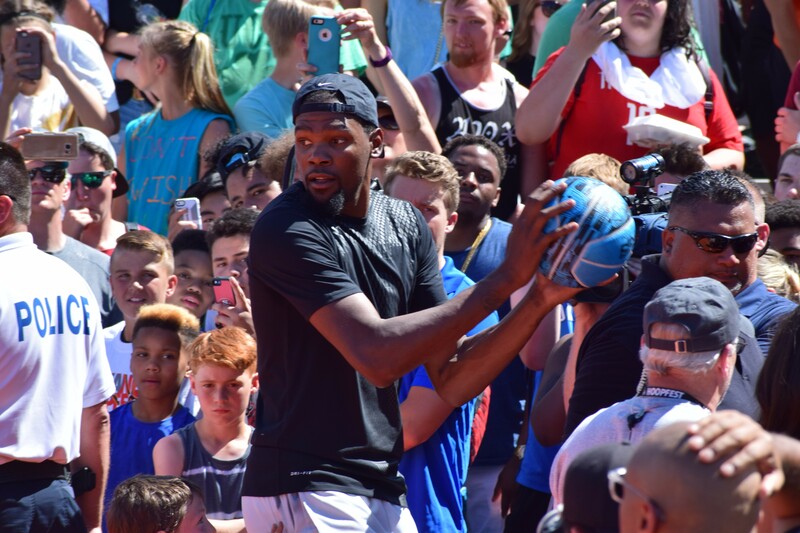 For Durant, Hoopfest is all about the joy of basketball. "Basketball is so precious to me, the game is so much fun, and I want everybody to experience the amount of fun that I have when I play, so, being in this environment creates that for you. So many kids probably leave this and go and work out every day after they finish this."